Question: When is a voucher not a voucher? Answer: When a legislator wants to perform slight of hand! 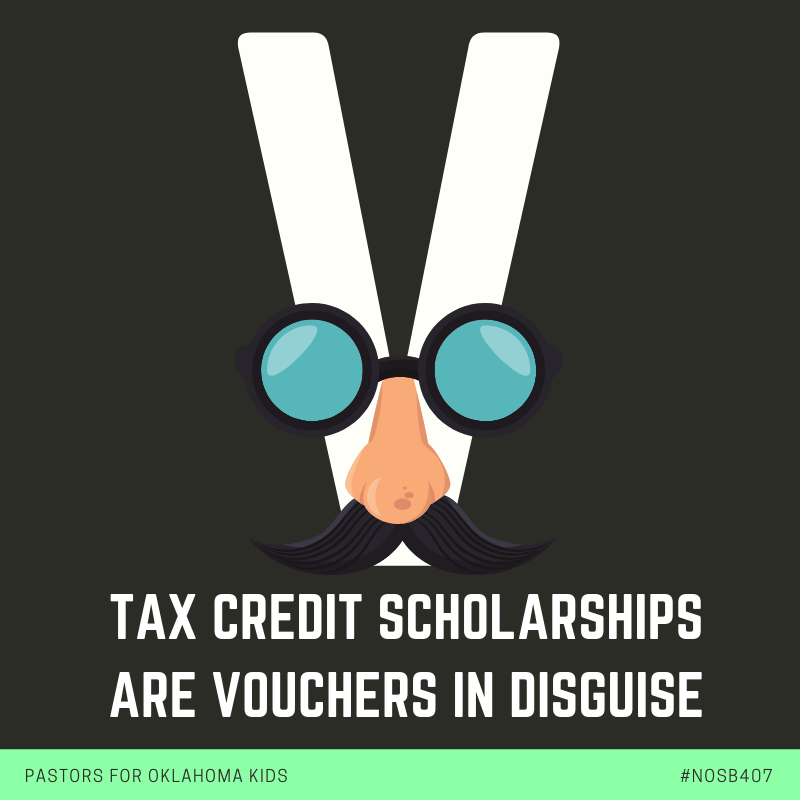 Make no mistake, SB407 currently under consideration by the Oklahoma legislature is a voucher bill. There is not a question in anyone’s mind. Not those that favor traditional vouchers nor those opposed to vouchers, like Pastors for Oklahoma Kids (and the vast majority of Oklahomans). The end result of tax credit scholarships is the same as a voucher. Albeit in a more deceptive manner. We shouldn’t be surprised. This is the same kind of game Oklahoma legislators played in 2017 with SB845 (‘If it looks like a duck’). In that case our Oklahoma legislators passed an unconstituional tax by masking it as a “fee”. The Oklahoma Supreme Court agreed with everyone with common sense. If it looks like a duck, swims like a duck, and quacks like a duck, then it probably is a duck. Similarly, Scholarship Tax Credits are functionally the same as vouchers. The reason for the refusal to use the language of “Vouchers”? Likely because Oklahomans have opposed them strongly - every single time they are introduced. In fact, when brought to a vote of the people - NO state has ever approved vouchers. It can only be shoved through by legislative malfeasance, games, and slight of hand. And WHY? Why does all this matter? Because vouchers are NO good for 700,000 kids in public schools in Oklahoma. They end up hurting public education and are an attack on the ideals and purpose of public education as set forth in our State Constitution. We are against vouchers in our original 2016 Declaration on Public Education that hundreds of Oklahoma’s pastors & faithful have signed. There is a moral argument against privatization of public education. This is nothing new. It’s a tune we’ve heard before. Garbage In = Garbage Out with Scholarship Tax Credit "Research"
I remember the first time I took a computer programming course, the instructor was explicit that if we put garbage into the code we would definitely mess up the program, not pass the course, and only garbage would come out. She was right, my program was terrible. One of my fears is that legislators in Oklahoma would make policy decisions impacting Oklahoma’s 700,000 children based on garbage “research” that is little more than public relations regurgitation from school privatization PR firms masquerading as “think tanks”. When talking about policy that impacts this many kids in our state we cannot stand by and allow anyone to pull the wool over our eyes. The Oklahoma Council of Public Affairs (OCPA) is the chief among these “think tanks” in Oklahoma pushing for privatization of public education. This group rarely has a positive word about our public school teachers, kids, or administrations. Yet is first to demean anyone standing up for, speaking up for, or defending our good local community public schools. Then cry “public schools are failing”. Offer privatization as the magic solution. If it seems like a sinister, self-perpetuating prophecy to you…you’re not alone. Their latest “research” is an opinion poll they paid for in a Hail Mary effort to convince Oklahoma legislators to approve a historic 500% increase in redirecting what would have been revenue to support public education and services to private schools instead. #1 - If we evaluate the audience polled in the published report (rather than the PR piece everyone is reading) we find quickly that only 501 people were interviewed. This is an incredibly small sample size. #2 - We next must scrutinize the wording of the questions asked. This is important because decision making needs to be based on having all of the facts. This is why attorneys must bring forth evidence in a court case. This is also why asking loaded questions is not allowed. For instance, “Have you stopped beating your dog?” When we force someone to answer (as in the survey) with a Yes or No binary response it validates the premise, that one ever began beating their dog in the first place! Likewise, when a survey question does not account for the consequences of the action and explains in flowery language all the positives without accounting for the backlash - it sets up a false choice. Not unlike asking someone if they’d love to experience a thrill and rush like never before called skydiving without mentioning parachutes are not included. “a program that encourages private donors to contribute” - on face value this sounds innocuous enough. However, there is no explanation that this is not simple charity. Rather the “encouragement” is that the state treasury of Oklahoma REFUNDS 75% of the gift back to the donor in the form of tax credits. ”Scholarship” Granting Organizations advertise to donors that they should donate to them above United Way, nonprofits, and churches because they get money back! Doesn’t sound like a charitable program. “ for lower-income students to attend nonpublic schools.” Private schools. Just say private schools. Why didn’t they? Because over and over, across Oklahoma and the nation - public funding to private schools is soundly defeated. The people speak and “think tanks” ignore. And how many lower-income students receive these scholarships? Or how many students that are not lower-income receive them? I keep asking. I keep hearing crickets. It’s not possible to say based on this question that Oklahoma voters would support taking money away from essential core services like Public Schools, mental health, roads & bridges, rural health care, and other core services to fund these private school grants. #3 - Finally after taking all this into account we can determine the validity of conclusions published. It should be pretty obvious just how few conclusions could be made with a skewed opinion poll like this. The small sample size, the program isn’t explained, the consequences are left out, and a binary option is given. Even further, Oklahomans have spoken clearly about public funding going to private schools. They say NO. Religious liberty is dependent on the government staying OUT of church. Period. We do not want or need the government’s revenue to fulfill our God-given missions. In 2016, with an amazing amount of conservative voter turnout, voters turned DOWN State Question 790 that would have allowed public money to be spent for religious purposes like private Christian and parochial schools - the vast majority of the recipients of the Scholarship Grants in Oklahoma. To expand private school grants while at the same time not being able to figure out how to appropriately fund our public schools, which are a constitutional right as defined in Article 13 of the Oklahoma State Constitution, is akin to legislative malpractice. Listen to your constituents who voted for religious liberty in 2016. Listen to the State Constitution you swore to uphold and defend. Listen to the taxpayers who cannot afford to fund two levels of public schools in Oklahoma. Listen to the parents who just want good, fully funded, neighborhood public schools for their kids. Do not pay any heed to the garbage “research” or you will likely have garbage results. *CORRECTION: This blog post has been updated from it’s original writing to due to the geography data that appears to be mislabeled and not misrepresented as originally thought due to the discrepancy between survey reports. “The free public school system in Oklahoma is the glory of our State,” according to the Rev. Evan D. Cameron. Cameron, a Baptist pastor and Oklahoma’s first State Superintendent of Public Instruction, wrote this in 1908 in his first report. Fast forward to April of 2018, when a glimmer of hope appeared on the horizon for the first time in a long time that Oklahoma might be plotting a course to restore the glory of an excellent free public school system in the Sooner state. In spite of chronic underfunding, Oklahoma public schools have been trying to move forward in the 21st century. We should encourage and fund their new and promising initiatives. The one-size-fits-all institution where students enter and exit like a cookie cutter factory are a thing of the past. Now is the time to double down our investment in innovation in public school choices like magnet schools, Advanced Placement (AP) courses, career internship programs, credit recovery, wraparound care, robust extracurricular options, and academy/specialty campus approaches with STEM, bilingual, fine arts, medical, or early childhood programs. School district sponsored non-profit charters with open-enrollment serving students from a defined geographic area with specialty focus show much promise as well. We must ensure access to these kinds of choices for kids in urban, suburban, and our rural schools across the state. This will take significant investment and political will. But privatization advocates and their big money “think tanks” seek to derail this forward momentum. Several bills facing our legislators this session would be devastating to public education in Oklahoma. Privatizers are quick to condemn public schools for seeking further investments that would benefit 90% of Oklahoma’s children. Yet at every turn, they have their hands out for government subsidies in the form of vouchers, tax credits, and for-profit charters. Resources that could have funded innovative solutions for the overwhelming majority of Oklahoma kids, instead end up in the pockets of a few CEOs or private schools. At the same time, the more taxpayer funding we take from public schools and send to private schools the less transparency and accountability we have for our most important investment: the next generation of Oklahomans. Choosing to not invest in public education by sending money to private corporations means locking out 700,000 Oklahoma kids from these innovative options while giving preference to a tiny fraction, just 5% of families choosing private schools. And while everything from bullying to homelessness is being used to push private school vouchers, no one can deny that public schools care for these kids spread out across the entire state. The fact that they serve growing numbers of students with dwindling investments from our state legislature is a tragic error. We are either all in for all Oklahoma kids or we are not. Anything less means picking winners and losers among our children and reeks of corporate welfare for those who need it the least. To be clear, Private School Vouchers and their close cousin Tax Credit “Scholarships” would defund the vast majority, 700,000 kids, in Oklahoma’s public schools by millions of dollars. This is no time to experiment on the next generation by further shorting our public school children. Our hope is that Governor Kevin Stitt, House Speaker McCall, and Senate Pro Tem Treat will take seriously the investments needed in all Oklahoma kids and not just fall into line with the influential anti-public education ideologues and lobbyists. Otherwise, the hope to restore our public schools as the glory of the state looks quite bleak.